I bought a huge fillet of salmon the other day and wondered what to do with them. The only idea that popped into my head was pan fried teriyaki salmon. Yawn! So I saw this recipe on Jamie Oliver's Food Tube. 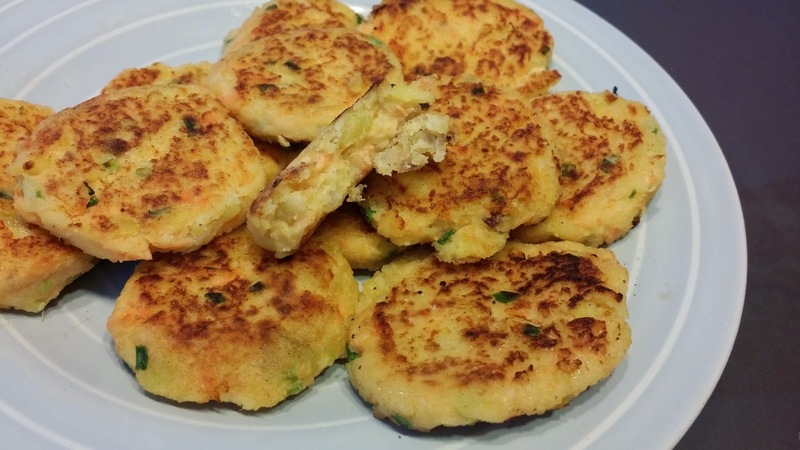 This lady named Kerryan made these giant salmon cakes and they look simple enough! Well, I was all ready to make these for the kid's lunch when I realised that I'm missing some ingredients. So I improvised and it turned out delicious! In fact, I think my recipe was even more nutritious as mine got some sweet potatoes added into them. As everybody knows, sweet potatoes are "power food" and sooo good for you, hence I'm naming mine, Power Salmon Cakes! Haha.. Steam potatoes and sweet potatoes together for 10mins. Steam salmon for abt 5-10mins till just cooked. Mash all ingredients in a large bowl. If u don't mind the raw egg, taste it to check seasoning. Dust your hands with flour and roll into balls. With low heat and abit of oil, slowly pan fry them till golden brown. On hindside, the mixture was so sticky, I'm not sure if the original recipe requires flour or not. But I believe not putting enhanced the flavor of the ingredients! Maybe next time I'll just scoop with a ice cream scoop and into the pan directly. The best way to describe this dish would be, begedil with salmon in it! Very kids friendly, very delicious and nutritious. A definite must try! Picture Window theme. Theme images by carlosalvarez. Powered by Blogger.